We asked our doctors what some of the most common patient complaints are at their annual comprehensive eye and vision examinations. Many patients talk about the same symptoms, “tired eyes, watery eyes, sandy/gritty eyes, and just plain ol’ dry eyes.” Most patients chalk this up to, “just the air being dry in Colorado,” or their symptoms connected to the inevitable, “working at the computer 8-10 hours a day.” So is that it? If you work at a computer or live among the mountain air you are cursed to uncomfortable symptoms of dryness day in an day out? Not at all. Lots of new techniques and technologies allow for advanced treatment of dry eyes and the eye doctors at Vista Eye Care, Dr. Brian Abert, O.D., FAAO and Dr. Deanna Pedroza, O.D., are here to help. 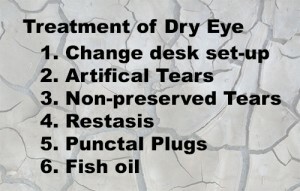 But before treatment can be prescribed, we have to determine what type of dry eye the patient has. The most common type of dry eye is simply that the eyes are open too much. If you work at a computer screen, or have to read for a living, your attention span eventually will override your eyes’ longing to blink, and the time between your blinks will increase. The result? Dried-up tears. Longer times between blinks means that your tear layer will be more likely to evaporate, and with that vaporization goes your eyes’ moisture and ultimately your comfort. The cornea is the most sensitive part of the entire body (don’t believe it? Remember the last time a little eyelash got in your eye and ruined your day?) and if there isn’t a layer of fluid (tears) covering your cornea, it will transmit signals to your brain, starting with discomfort and eventually moving to shooting pains. If you work at a computer for long periods of time (and lots of our patients certainly do), your best bet is to first make sure your computer monitor is slightly below your line of sight so that your direction of gaze isn’t upwards towards the screen where your eyes will be at their most open. Next, you can take steps to preserve your tear film. Eye drops are commonly used by our patients and the vast majority of the drops they use are either harmful for their eyes or not effective at all. Watery, “redness-removing drops” don’t help with eye dryness, and in fact adding all the extra chemicals to your eyes doesn’t help much in the first place. If we need to thicken up the tear layer to make those tears stay in place longer between blinks, what we need is a mild artificial tear that can boost your own tears’ viscosity and keep a layer of fluid on your cornea where it belongs. Our doctors generally recommend Systane Ultra or regular Systane, or Refresh Tears. Those drops are excellent at keeping the tears present between blinks. Best of all, using a non-preserved artificial tear will help keep all unnecessary chemicals out of the eyes. What about the patient that just can’t produce any tears at all? Older female patients are particularly at risk for just having really dry eyes due to a lack of tear production. The solution here is to increase the amount of tears, period. Artificial tears do work well, but they have to be constantly applied. For better long-term management, our optometrists recommend fish oil which helps increase tear production. For some patients we will prescribe a medication called Restasis. Restasis is the only medication on the market that is shown to increase the amount of tears that the body produces. This effect takes a while to kick in, but we have many patients who have used and done well with taking Restasis. Punctal plugs are small, silicone devices that we typically place in the lower puncta, or tear drain, in the lower lid located towards the nose. These plugs prevent some of the tears from draining and thus allow for retention of more moisture in the eyes. Inserting the plugs is easy, and while silicone plugs are considered permanent, they are removable if the eyes are too watery afterwards. Punctal plugs are great because they allow for long-term management of dry eyes. Once the plugs are in place, using artificial tears is more practical because those tears will stick around longer since they aren’t just falling down the drain. What about patients that have tears, but their tears are of poor quality? Thin, watery tears are problematic because those tears don’t offer much protection to the cornea. Often those eyes are missing a crucial tear-oil layer to the tears which helps prevent tear evaporation. The cornea dries out and as a consequence the lacrimal gland goes into overdrive, dumping more tears downstairs and causing the paradoxical dry eye –that is, the eye is watery because it is so dry. Those patients need special artificial tears to restore the oil layer and our doctors really like Systane Balance which is formulated to address that specific type of dry eye. Fish oil supplementation is also helpful in increasing the quality of the tears. 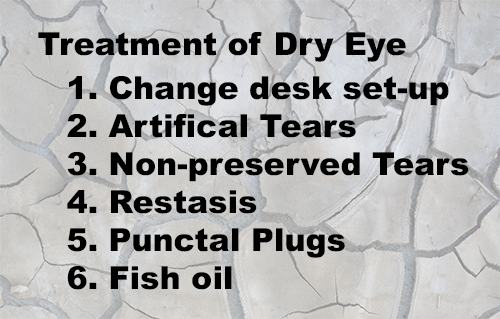 Dry eye can result in itchy, irritated, watery, red eyes, and successful treatment of dry eye is best achieved by addressing the specific cause of the patient’s dryness. Vista Eye Care is Thornton, Brighton, Westminster, and Northglenn’s premiere eye care center, dedicated to keeping your eyes healthy and vision great. Please call us at (303) 450-2020 to schedule your annual eye and vision check-up, or to schedule a dry eye-focused visit. We can help manage your eye dryness and keep your eyes sparkling and happy!